Hilda Charlton was a spiritual teacher, author, dancer, and healer who touched and uplifted the lives of many thousands during the twenty-three years that she taught classes in meditation and prayer in New York City. Born in London, Hilda moved to the United States with her parents when she was four years old. She was raised in Salt Lake City, Utah, and Los Angeles, California. At the age of eighteen, she began performing as a modern dancer, and for the next two decades she danced and taught in the San Francisco area. From 1947 to 1950, Hilda toured India and Ceylon as a dancer. 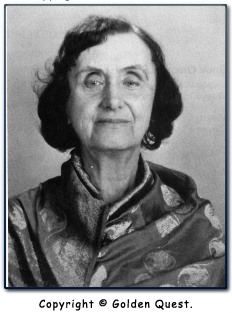 She stayed in India and Ceylon for fifteen more years, pursuing her studies in mysticism and meditation. She was guided by great spiritual masters and holy people, including Sri Nityananada of Ganeshpuri, Sri Mahadevananda of Bombay, and Sri Sathya Sai Baba of Puttaparthi. Upon her return to America, Hilda settled in New York City. She was asked to teach by those she met, and over the years her classes gew in size from two people to more than a thousand. The location was moved from a student's apartment to the basement of St. Luke's Church, and in 1976 to the nave and later to the Synod House of the Cathedral Church of St. John the Divine. Her teachings incorporated the fundamental principals of the world's major religions. Foremost in her classes, she stressed the importance of a life of giving and forgiving, unconditional love and remembrance of God. Hilda's lectures included poignant stories of her life, practical lessons for everyday living, and guidance in prayer and meditation. Her style combined humor, practicality, and deep insight into the human mind and spirit. Her teachings had a profound effect on the lives of thousands of people from all walks of life. Alcoholics and drug addicts were known to conquer their addictions, prostitutes left the streets, and those afflicted with serious diseases often reported experiencing remission and cure. She passed on in New York City on January 29, 1988.